Learn key information on the planning and development requirements in the Town of Sedgewick as well as detail on the hierarchy and relationship of the Town’s Statutory Plans. 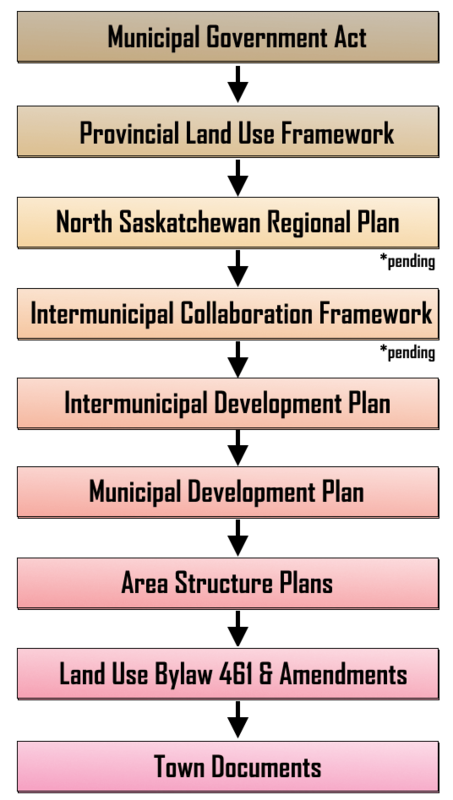 The Municipal Government Act identifies the hierarchy and relationship of statutory plans, so that each plan will be consistent with the plans above it and, in the event of an inconsistency, which provisions in what plan will prevail. Land use planning in Alberta must follow plans at both the provincial and municipal level of government. With the implementation of the Provincial Land Use Framework and the Alberta Land Stewardship Act, some planning decisions will be made at the regional level as well. Land use may also be subject to other federal and provincial regulations. The graph to the left outlines the Town of Sedgewick’s hierarchy of land use planning decisions with links to the documents below. The Town of Sedgewick requires that anyone who is building or demolishing any type of structure to apply for a Development Permit prior to starting a project. A Development Permit addresses such things as restrictions pursuant to the Land Use Bylaw with regards to zoning, setbacks, parking, etc. The Town will advise whether or not a project requires a Building Permit, which is facilitated by Superior Safety Codes Inc. within the Town of Sedgewick. A Building Permit addresses legislation under the Alberta Building Code with regards to construction, materials, etc., and provides inspection services to ensure the construction complies with the Legislation. other construction proposals may also require a Development Permit – please contact the Town for verification. A site plan: a drawing showing the layout of the proposed development on the lot, with measurements showing the side/front and back yard setbacks from the property lines. All legal information – i.e. Legal Address, ownership of property, and zoning. Please Note: Development Permits require payment in full prior to application processing and approval. Please Note: it is the policy of the Town of Sedgewick that all Town utility services (water and sewer) must be located and installed at the time of the digging of a basement. Note: it is the Owner’s responsibility to locate the survey pins on their lots. A metal detector can be borrowed from the Town to facilitate this process; older areas of Town many not have metal pins. Find information about getting a Development Permit or a Demolition Development Permit. Do you know what your property’s zoning classification is? Find out with the Town of Sedgewick Zoning Map. All development in the Town of Sedgewick must conform to Land Use Bylaw #461 and Amending Land Use Bylaws #483, #487, #504, #505, #506, #512, #520, #521, #527, #534, #544 and #547. Find out more here. Once the Development Permit has been approved, the Owner shall submit a copy of the Permit to Superior Safety Codes Inc. in conjunction with an application for the appropriate discipline(s’) permit(s). The Town of Sedgewick contracts permitting services to Superior Safety Codes Inc. for the Building, Electrical, Plumbing, Natural Gas and Private Sewage disciplines. Superior Safety Codes Inc. requires a copy of the approved Development Permit prior to issuing any Permits. Check for power lines and your safety; contact: Fortis. Since December 1, 2017, new homes constructed in Alberta must be built by a licensed builder. Owner builders constructing their own home can apply for an Owner Builder Authorization. The Builder Registry is an on-line source of information to search Alberta’s licensed residential builders. Builder licensing is intended to reduce the risks prospective home owners face by establishing a licensing system, providing consumers with information on builders, and creating provisions to remove or suspend builders when necessary to protect home owners from negligent or unscrupulous businesses. Builder licensing applies to anyone constructing new homes, including condominiums and large multi-family homes, as well as renovations when a residential construction project requires new home warranty coverage. if the builder has any orders or administrative penalties issued under the new Home Buyer Protection Act and related Regulations.